Based on the novel The Price of Salt by Patricia Highsmith, Carol is the story of a love affair in the early 1950s between a young yet aspiring photographer and an older woman that is considered forbidden in those times. Directed by Todd Haynes and screenplay by Phyllis Nagy, the film is an exploration of a lesbian love affair being kept secret during a time where homosexuality was taboo. Starring Cate Blanchett, Rooney Mara, Sarah Paulson, Jake Lacy, and Kyle Chandler. Carol is a ravishing and evocative film from Todd Haynes. Set during the holiday season of 1952, the film follows the forbidden love affair of a recently-divorced woman in her 40s and an aspiring photographer in her 20s as they keep it a secret. It’s a film that explores two women who are attracted to one another as they both seek something to escape in as the titular character (Cate Blanchett) isn’t just coping with the aftermath of a divorce as well as the expectations of being part of conventional society. For Therese Belivet (Rooney Mara), she is just someone trying to find herself as she works temporarily as a shop girl in a mall where she would meet Carol Aird who is shopping for a Xmas present for her daughter. A simple suggestion would become something more as Therese would mail the gloves Carol accidentally left at the mall and return them in which Carol would invite Therese for lunch as it leads to a relationship. Phyllis Nagy’s script has a unique structure though it starts off with Carol and Therese having a dinner as it would be shown again in a different perspective as it then flashes back to Therese reflecting on her romance with Carol. The first act is about the meeting of the two women but also the complications in their lives as Therese has a boyfriend in Richard (Jake Lacy) who wants to marry her but she isn’t sure as she wants to go into photography. Carol is dealing with her divorce from Harge (Kyle Chandler) who doesn’t want to let her go though he knows about her infatuation with other women including longtime friend Abby (Sarah Paulson). Things intensify when Harge threatens to take their daughter away as he wants to rekindle things with Carol who isn’t interested as she becomes conflicted. The second act is about the two women escaping from their problems as they go on a road trip around the country where their romance would reach its peak. The third act is about the two women both venturing into separate journeys as well as the decisions both women would make for themselves as well as wanting to meet each other as it goes back to the opening scene. Todd Haynes’ direction definitely stylish in terms of the compositions and scenes he creates as it definitely recall elements of old-school Hollywood of the 1950s. Though it’s set partially in Manhattan and rural parts of America such as Ohio, the film is largely shot in Cincinnati as well as other parts of rural Ohio to play into this world of 1950s American suburbia and the city as Haynes would use some wide shots to establish the locations. Yet, Haynes would go for intimacy in the medium shots and close-ups as it relates to the drama such as the way Haynes would shoot things inside a car through a window or what is going on at a hotel room. Haynes’ direction would also have that air of simplicity in the way he would present these intimate moments between Carol and Therese as Haynes usage of reverse-shots and medium shots help play into the way their conversations are carried as well as what happens when the two are equals. Haynes would also maintain a sense liveliness for the scenes set on the road but also some melodrama as it relates to the family drama that Carol is enduring where Haynes would bring in bits of melodrama but not in an over-the-top fashion. By the time the film reaches the third act where it’s about Carol and Therese on their own as well as longing for each other. It does play into a world that is starting to change where Therese is finding herself as an artist while Carol’s world is falling apart. The direction becomes more wide open visually while the opening scene of the two women meeting each other is shown a new perspective as well as emphasizing more of where these women are at this point in the story and where they could go. Overall, Haynes create a rapturous and mesmerizing film about two women falling in love with each other in the early 1950s. Cinematographer Edward Lachman does brilliant work with the film‘s gorgeous cinematography as its usage of colors for many of the interior and exteriors would have this dream-like quality for many of the scenes set in the day and night while having a crispness in the image since the film is shot in 16mm with 35mm lenses. Editor Affonso Goncalves does excellent work with the editing as it‘s largely straightforward though it does have some rhythmic cuts to play into some of the melodrama. Production designer Judy Becker, with set decorator Heather Loeffler and art director Jesse Rosenthal, does amazing work with the set design from the way Carol‘s home looks like from inside as well as the apartment of Therese and the hotel rooms the two would stay at during the road trip. Costume designer Sandy Powell does fantastic work with the costumes from the dresses of the women as well as the hats and jewelries that they would wear. Key hair stylist John Jack Curtin and makeup artist Anne Taylor do terrific work with the look of the hairstyles and the kind of makeup the women wore at the time to display their beauty. Visual effects supervisor Chris Haney does nice work with some of the minimal visual effects as it is mainly bits of set dressing to play into the period of early 1950s New York City. Sound editor James David Redding III does superb work with the sound in the way some of the sparse moments in the mall sounds as well as how music is heard in some of the rooms as it help establish that sense of atmosphere that Carol and Therese would encounter. The film’s music by Carter Burwell is incredible for its sumptuous orchestral score that play into the drama with its lush string arrangements that is very low-key in parts but also sweeping in some of the melodramatic moments while music supervisor Randall Poster creates a wonderful soundtrack of music from that period from artists and acts such as the Clovers, Billie Holliday, Georgia Gibbs, Les Paul and Mary Ford, Jo Stafford, Helen Foster and the Rovers, Perry Como, Annie Ross, Eddie Fisher, Pee Wee King and His Golden Cowboys, and many others. The casting by Laura Rosenthal is marvelous as it feature some notable small roles from Sadie and K.K. Heim as Harge and Carol’s daughter Rindy, Trent Rowland as Therese’ colleague Jack who appears in the film’s opening sequence, Carrie Brownstein as a woman Therese meets at a party late in the film, Kevin Crowley as Carol’s attorney in regards to issues relating to Harge, Cory Michael Smith as a traveling salesman named Tommy that Carol and Therese meets, and John Magaro as Dannie McElroy as a newspaper writer who would get Therese a job as a photographer for a newspaper. Jake Lacy is excellent as Therese’s boyfriend Richard as a man who wants to give Therese a lot yet has no clue about what she’s feeling. Kyle Chandler is fantastic as Harge Aird as Carol’s ex-husband who is eager to get back with her yet would make threats relating to their daughter as he feels neglected in favor of other women. Sarah Paulson is amazing as Abby Gerhard as Carol’s longtime friend who was once a lover of Carol as she is one of the few that knows about Carol’s relationship with Therese as she would be a crucial figure in the third act as it relates to Therese about Carol. 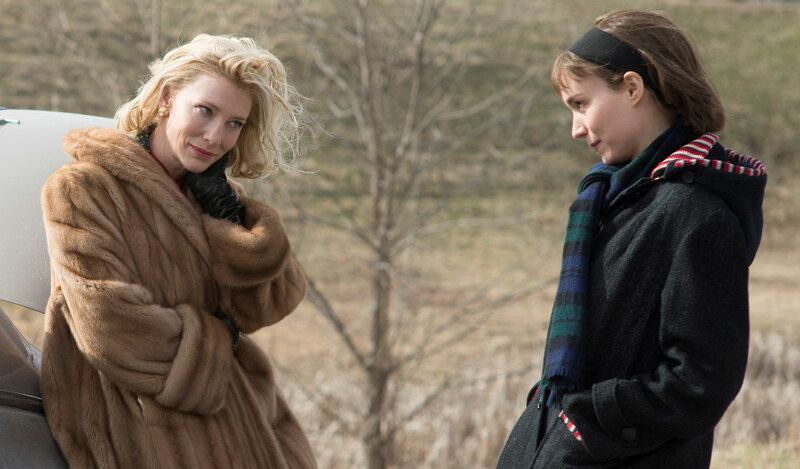 Rooney Mara is phenomenal as Therese Belivet as a young woman who falls for the titular character as she tries to keep her feelings in check yet is fascinated by Carol as it is this restrained yet touching performance from Mara as she has a great sense of rapport with her co-star in Blanchett. Finally, there’s Cate Blanchett in a sensational performance as the titular character as a woman who is dealing with issues with her family as she becomes intrigued by Therese as she sees her as something special as there is an air of radiance and anguish in Blanchett’s performance which definitely stands as one of her best performances of her illustrious career. Carol is a tremendous film from Todd Haynes that features astonishing performances from Cate Blanchett and Rooney Mara. Along with a great supporting cast, gorgeous visuals, a fantastic music soundtrack and score, and a riveting story of forbidden love. It’s a film doesn’t just explore the complications of love but also what people will do to express it to each other. In the end, Carol is a spectacular film from Todd Haynes. I wanted to like this film so much and I just couldn't. I liked the acting and the cinematography, but it bored me like the book did, and that's a shame because it should be a very powerful story. I can understand why it didn't work for you. It's not a film for everyone. I was really into the story as well as the romance. I heard there was a lot of things in the film that Haynes cut out due to reasons relating to the story as I'm sure there's deleted scenes in the DVD/Blu-Ray that figure what Haynes cut out from the film.